In a busy family household, it’s almost impossible to keep things in their rightful place. Car keys go AWOL, your left shoe is by the door but not the right, that 32 piece cutlery set has somehow been whittled down to 29 and on it goes. It’s no secret that the key to having a neat and organised home is good storage – if you’ve got somewhere to put something it’s less likely to clutter or go walkabouts. But there’s no use just filling your home with endless boxes or putting up shelves only to have them be your family’s ‘drop spot’. 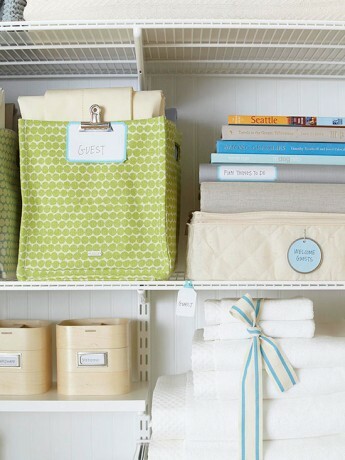 Careful decision making when choosing storage will go a long way in helping you keep things ship shape but stylish. If you’re looking for storage ideas for your new home or you simply need to re-think your storage strategy, here are a few inspiration ideas to jumpstart the project. For non-decorative items, the best place for them is the cupboard. Multiple shelves will also help you categorise. If you’re thinking of building a cupboard make sure it’s located near to the area where its contents will be used, that way you can easily put them away when fun time is over. 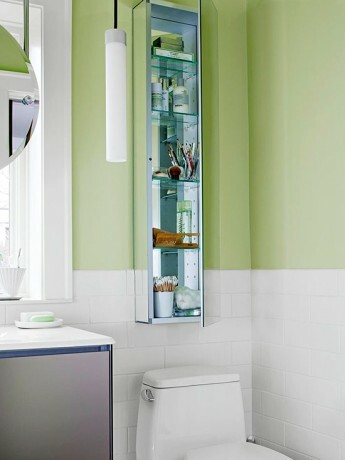 Ideally, your bathroom mirror should also double up as a cabinet to avoid clutter, spillages and for a little added discretion when you have visitors over. A thin design like the above is brilliant for small spaces. The foyer is the first stop when you enter a house and from here clutter can spread everywhere. 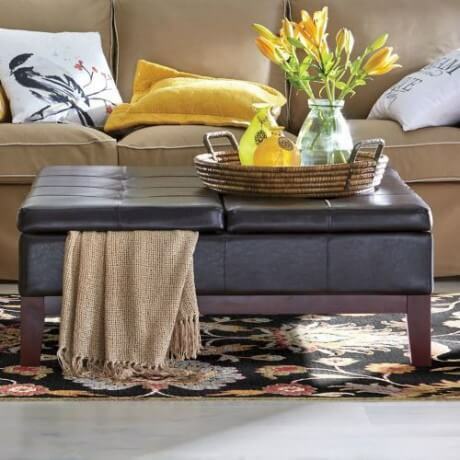 An entryway storage unit will be able to hold everything from shoes to backpacks while a bench makes for a good temporary landing spot for guests to drop their bags when they arrive. Make use of hooks and hat stands here too. 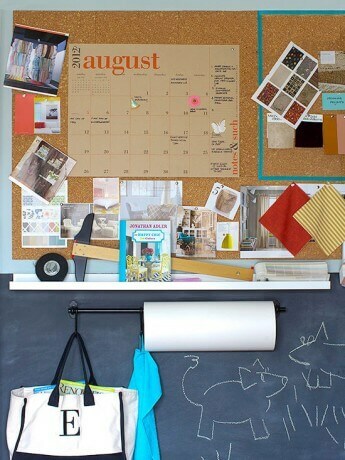 Your home office is likely to be more than just a place when you complete your daily work, especially if you have kids. Pens, receipts and post will all land here so having multiple drawers will help you divide and conquer. Why not dial up the organisation a notch and throw in some labels? You’ll thank yourself when you’re in a rush to get the house ready for guests. Nowadays stylish food storage is easier than you think. Clear jars can be recycled and are incredibly practical for storage given their translucency ­– they’ll also add a vintage feel to your cupboards. Opaque containers, available at most homeware stores, lend a striking modern feel and are easy to clean. It’s a bonus if an attractive piece of furniture also doubles up as a storage unit. Ottomans fit the purpose brilliantly providing you with a place to keep extra blankets and throws, and a fantastic spot to put your feet up. When it comes to your ultimate comfort zone (the bedroom) a bedside table is a must. It’s always a surprise when you think of how much you need at hand – books, glasses, eye drops, creams – they all need to live here. That said you should opt for something with a wide or long surface. A chest of drawers will provide this as well as extra drawer space for your clothing. 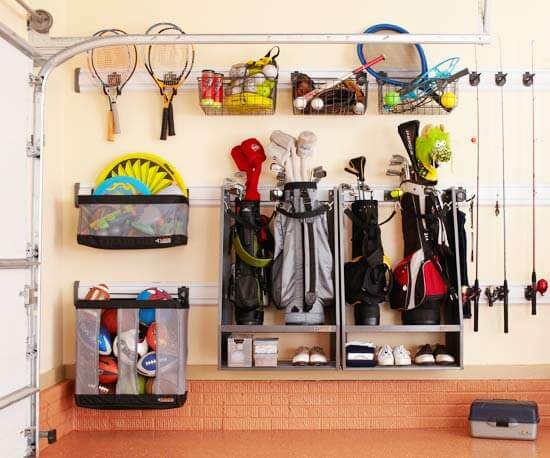 Count yourself very lucky if you own a garage because this will give you ample storage space especially for larger objects like sports equipment. To ensure it’s not simply piled up in one corner erect shelves, baskets and hooks (like the above) for easy access and orderliness. Finally, why not find a spot to store all your thoughts and tasks? A pin board or a chalk board will provide you with somewhere to jot down anything important, pin up invitations and organise your family’s social calendar.